The Atlantic Ocean covers almost one-third of the water's surface water area, and around one-fifth of its total area. 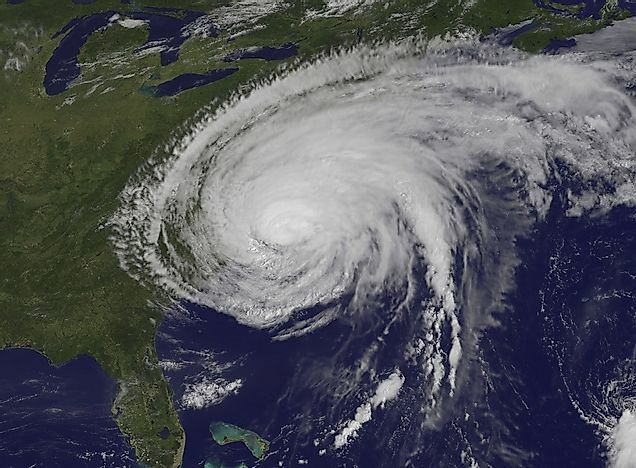 Hurricanes, such as Irene in 2011 (pictured) travel the breadth of the Atlantic before wreaking havoc in North America. The Atlantic Ocean encompasses over 20% of the earth's surface, and is the second largest ocean in the world after the Pacific. The Atlantic is also the ocean that has the saltiest seawater. Its area is a serpentine-shaped formation, with a basin that reaches east between Africa and Eurasia, and then west to the Americas. Its currents goes to all four other oceans, the Arctic, Pacific Ocean, Indian Ocean, and the Antarctic Southern Ocean, alike. Its climate is characterized by the warm or cool water that circulates within its different currents. The water's depths and the surface winds also influence the weather over its surface. May brings a very small chance of weather disturbance, though September sees the commencement of hurricane activities. The time that the supercontinent Pangea broke up, about 130 million years ago, was the beginning of the formation of the Atlantic Ocean. Geologists have determined that the Atlantic Ocean is the second youngest of the five oceans of the world. The Atlantic played a very important role in connecting the Old World with the newly explored Americas from the late 15th Century and onwards. It was also, unfortunately, an instrumental means by which to conduct the trans-oceanic slave trade from Africa into the Americas. The ocean trade routes that were established by Spain, England, and Portugal accelerated Europe's growth and conquest of both the New World and the African continent between the 15th and 19th Centuries. The Dutch also made a major contribution as important cartographers of its sea routes. The modern significance of the Atlantic Ocean may not surpass the great exploration days of the English, Portuguese, Spanish, and Dutch explorers, but it is still important for trade between Africa, the EU, the Mediterranean, and the Americas. The Panama Canal is being deepened and widened to allow bigger vessels to pass through its waterways, with the canal offering passage from Asia and the Pacific to the east coast of the Americas and the Atlantic. This has seen a revitalization of trade between Europe, Asia, South America, and North America alike. In addition, the Atlantic Ocean has gas, petroleum, precious stones, placer deposits, and poly-metallic nodules found under its ocean floor. Its shorelines also are good source of sand and gravel aggregates. The Atlantic Ocean flows into the Pacific Ocean, though their habitats are often not at all the same due to water temperature variance, ocean currents, sunlight, nutrients, salinity, turbulence, substrate, and endemic flora. The Atlantic Ocean has both coastal and open ocean habitats. Its coastal habitats are along its shoreline and extending to its continental shelves. The open ocean habitat begins after the continental shelf gives way and passes into the deeper oceans. Two types of habitats are always present there, namely the pelagic, which is on the upper half of the water column, and the demersal, which is the lower half, at the bottom of the ocean floor. Marine flora typically belong to the upper half, though closer along its coastlines coral reefs, mangroves, kelp forest, and sea-grasses can be found at most levels. Currently there are considerably fewer territorial disputes in the Atlantic Ocean than what is presently seen in the Pacific. However, the International Hydrographic Organization has been known from time to time to re-define their oceanic and sea limits, sometimes not lining up with territorial boundaries of countries. In 2002, the IHO moved the Atlantic Ocean's southern limit to 60°South, down to the border line of the Southern Ocean close to the Antarctic. However, this change hasn't been ratified yet. Environmental issues, such as municipal sewage, industrial wastes, and oil leaks, remain a threat to marine life and people throughout the Atlantic. The use of drift nets and other irresponsible fishing practices also unnecessarily kills marine life and birds on a large scale. There were also concerns in 2005 that the northern European water currents had slowed down, and ongoing climate change continues to threaten low-lying coastal areas with ever-rising sea levels.